Key difference: The Alcatel One Touch Idol is the official mobile partner for the movie Iron Man 3. It features a 4.7 inch IPS LCD capacitive touchscreen with 16 million colors. The display has a resolution of 540 x 960 pixels. The phone is powered by a Dual-core 1 GHz MediaTek MTK 6577+ and a 512 MB of RAM. Samsung Galaxy Grand is a mid-range smartphone that has been launched by the Samsung Corporation. The phone sports a 5-inch capacitive touch screen with a display of 480 x 800 pixels. The phone runs on 1.2 GHz Dual-core processor and has 1 GB RAM. Due of all these mid to low-range smartphones being introduced by companies, big power houses have been forced to introduce similar mid to low-range smartphones to recapture market share. The Galaxy Grand is one such attempt by Samsung. 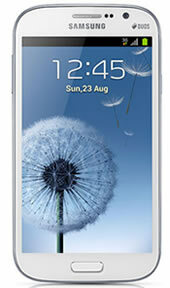 Samsung Galaxy Grand is a mid-range smartphone that has been launched by the Samsung Corporation. The phone sports a 5-inch capacitive touch screen with a display of 480 x 800 pixels. The phone is cased in polycarbonate plastic and is rectangular in shape with curved edges similar to other Samsung phones. The phone runs on 1.2 GHz Dual-core processor and has 1 GB RAM. The phone is dual-SIM, but is also available in single SIM in some countries. The phone runs on Android 4.1.2 Jelly Bean, with no words on if it can be upgraded to 4.2.2 Jelly Bean. One worth noting feature of the phone is the Multi Window, which allows users to seamlessly multi-task, without have to minimize one application and run another. The applications run side-by-side, or in this case up and down. The company has a mounted an 8 MP rear camera and a 2 MP front camera, par with many smartphones available these days. The information for the detailed table about the two phones has been taken from the Alcatel One Touch website, the Samsung website and GSMArena.com. GSM 3G, HSPA-PLUS, EDGE/GPRS, HSPA+ 21/5.76Mbps, WI-FI, WI-FI Direct, Bluetooth support.